The Detroit IWW Solidarity Committee invites you to participate in an action at Whole Foods. 115 Mack Ave, Detroit in support of San Quintin, Baja California Farmworker’s Union, Alianza de Jornaleros; Sindicato de Jornaleros. SINJA, has called a global Day of Action to Boycott Driscolls and Andrew Williamsons on September 29, 2018. In your community, please bring awareness of the Driscoll Boycott, and why its important to use your Consumer Power to stop farmworker injustice. To this day 80,000 workers in search of employment have been forced to migrate from their homes. Places like Veracruz, Michoacán and Oaxaca where indigenous communities have been impacted by forgiven policies such as NAFTA and forced use of GMO corn, affecting the environment and communities. Workers are Earning between: $8.00 and or $9.00 dollars a day, at a piece-rate, and live in make-shift housing of plastic bags, sticks, and any type of throw-away material they can get. Often workers are working up to 12 hours a day with their children, and babies on the backs of women. Pesticides are sprayed over their bodies, and forced to work under hard heatwaves. The harvesting of berries also comes with insect bites, having to work in fear of being bitten by rattlesnakes, all while not being allowed to take breaks. You as the Consumer have the right to not buy these berries. We ask you to hold your own action in your own community in support of the Driscoll Farmworkers who want to get to the NEGOTIATING TABLE. PLEASE SUPPORT THE DRISCOLL BOYCOTT. The usual twice a month gathering of friends in Cass Park. 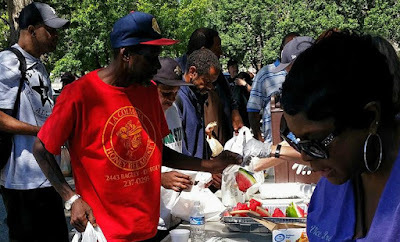 We share a meal, some clothing, the necessities and some genuine friendship. All are welcome to join us, just bring a heart for others. Most people feel better after a couple of hours in the park. The usual twice a month gathering of friends at Cass Park. We share a meal, some clothing, the necessities and some genuine friendship. Feel free to join us as we begin our eighth year in the park. We just ask that you bring a heart for others. The usual twice a month gathering of friends at Cass Park. We share a meal, some clothing, essentials and some genuine friendship. Feel free to join us, just bring a heart for others. The Detroit General Membership Branch Monthly Meeting will be held on April 25th 2018 from 7:00 PM ET to 8:30 PM ET, with dues collection beginning at 6:30 PM ET. It will be held at St. Peter's Episcopal Church, 1950 Trumbull, Detroit MI, on the corner of Michigan Ave. and Trumbull. The meeting will be in the kitchen, enter through the red door off of the parking lot. The usual twice a month gathering of friends in Cass Park. We share a meal, some clothing, the necessities and some genuine friendship. All are welcome, just bring a heart for others. Start your St Patrick's Day by helping us clean up Cass Park. It's been a long winter and the park can use some tender, loving care. This is the first of at least two clean-up days. We will provide trash bags. Please bring your own gloves. Of course this is weather permitting-- if the park is covered in snow, we'll reschedule. Please share widely. BE SURE TO WEAR YOUR GREEN! The Detroit General Membership Branch Monthly Meeting will be held on March 28th 2018 from 7:00 PM ET to 8:30 PM ET, with dues collection beginning at 6:30 PM ET. It will be held at St. Peter's Episcopal Church, 1950 Trumbull, Detroit MI, on the corner of Michigan Ave. and Trumbull. The meeting will be in the kitchen, enter through the red door off of the parking lot. The usual twice a month gathering of friends at Cass Park. We share a meal, some clothing, the necessities and some genuine friendship. All are welcome to join in, just bring a heart for others.